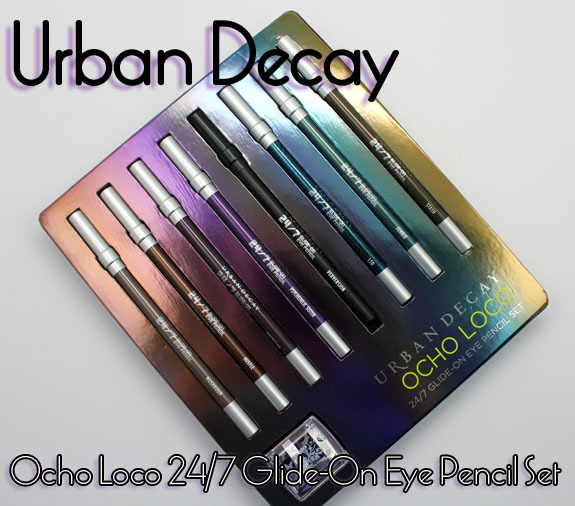 Urban Decay will soon be releasing a new eyeliner set called Ocho Loco 24/7 Glide-On Eye Pencil Set for holiday 2012. Ocho Loco means “crazy eight” in Spanish and that’s what they’re giving us. 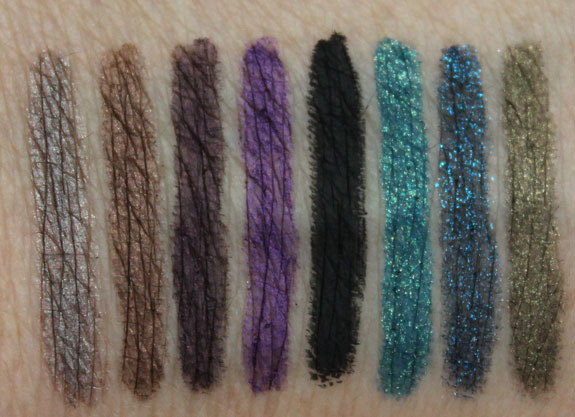 Eight awesome and crazy shades of their 24/7 liners with four new and exclusive ones! Also included in this set is my favorite liner sharpener ever, the Grind House Double Barrel Sharpener. Good for these liners as well as their fattier ones. Mushroom is a medium metallic greyish taupe (new and exclusive to this set). Hustle is a medium metallic warm brown (new and exclusive to this set). Rockstar is a deep eggplant purple metallic. Psychedelic Sister is a bright purple (new and exclusive to this set). Perversion is a jet black matte. Junkie is a bright teal with gold shimmer. LSD is a navy blue with blue shimmer (new and exclusive to this set). Stash is a medium olive green with gold shimmer. These liners have long been some of my favorite liners because I love the shades they offer, and they have really great pigmentation. The new shades are great but I especially love Hustle and LSD. Availability: Urban Decay, Ulta, Sephora, Beauty.com and Macy’s online only. What do you think about the Ocho Loco set? I like Mushroom and Junkie the most, but don’t think I’ll get the whole set. Mini sets are cool, but since I only line my lower lash line with these (and sometimes use them as an eyeshadow base), it takes me forever to even finish mini ones! Sunny @ Mostly Sunny´s last post…Before You Pop that Painkiller, Try the Escents Aromatherapy Roll-Ons! Yeah that makes sense. These are all full-sized too! I think…I WANT it!!! I love these liners…Bourbon is a go-to for me and Perversion is as great as everyone says it is. I have a bunch more of the colors, too. They have such a great color selection, love ’em. Hopefully Santa will give me a cash advance for all these upcoming makeup collections and limited edition items… My head is spinning today! Love the colors, specially Mushroom and Hustle. Hate the name though. AHH I know I will be putting this on my holiday wish-list!! 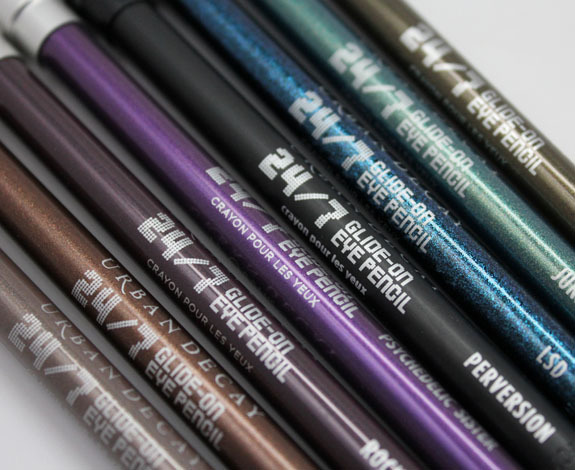 I love Urban Decay and their eyeliners especially, so I am super super excited for this! (can you tell from all the exclamation marks? Haha). I looove Mushroom and LSD oh my gosh! I like the colors, especially LSD, but I can’t get past the amount of product you lose when you sharpen. I think If i was going to pick up UD’s liners, it would be in this set! LSD looks gorgeous, but I don’t think I can justify buying a whole set just for that since I already have half the shades. 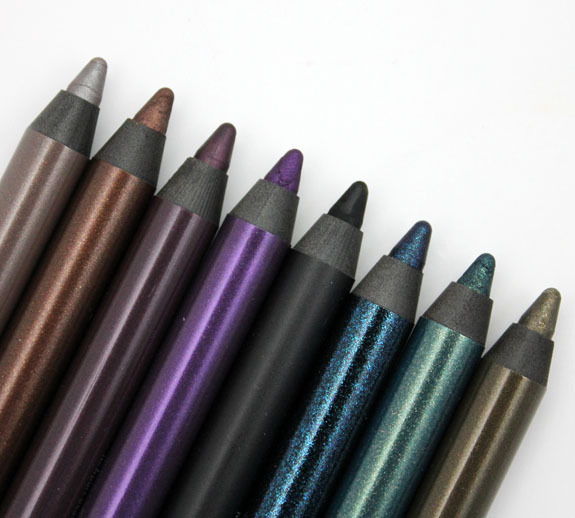 Junkie is the perfect cruelty-free alternative to MAC’s Undercurrent Pearlglide liner! Love this and will definitely be indulging. I still regret not getting the 15th anniversary set, so will not make that mistake again. I don’t think I have any of these colors in full size anyhow! YES! I’m so glad that they’re coming out with it. I’ll probably buy 2 sets. I’m running out of Rock Star, so this is perfect timing. Plus the new and exclusive colours look fun to wear. On the one hand, I know this set is a good value, and I’d love to add Psychedelic Sister and LSD (and maybe Junkie) to my stash. On the other, it’s not a good value if half the pencils will more or less remain unused because I have them (I’m far from needing a back up of the Perversion and Rockstar I got in the 15th anniversary kit) or because they’re colors I won’t use. Last year the UD holiday stuff wound up in deep discount at Nordstrom Rack. I may try and wait to see if they end up there again. Awesome swatches, I’m so excited for this! Can you tell us how Junkie compares to Undercurrent Pearlglide? Are they dupes? This is an amazing collection! Mushroom is to die for!!! </3 but $60?!?! I suppose thats not so bad, because its only $7 something each, but golly it seems expensive all in one purchase. 🙁 Sadly, these lovlies will have to wait to find a home with me. I wonder how close hustle is to underground. I have minis of Stash and Rockstar somewhere but otherwise I don’t have any of these colors (I have fullsize flipside, whiskey, and underground and a few other minis around though). So I’m thinking I’ll do this if I can get it at Friends and Family or the Sephora 15 discount. I hope these go on sale for Christmas!!! I really want these ,but it seems kinda expensive considering I don’t usually wear different color eye liner a lot. I’ll probably end up getting it though. These colors look so pretty. 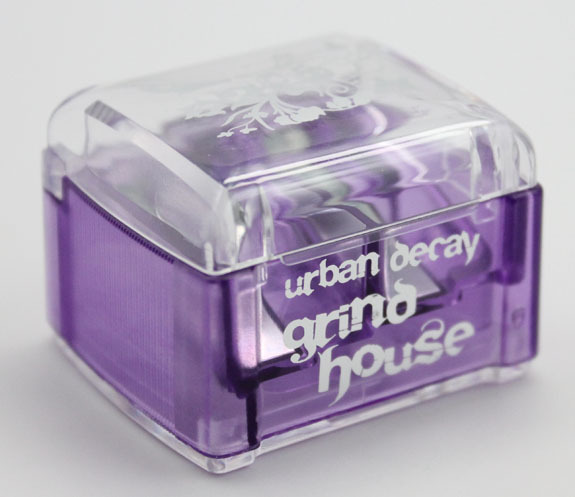 got an email from urban decay this morning that this is avail on their site! just picked one up and can’t wait! cant wait to see junkie and lsd! those sparkles look so pretty! I just saw that these are up on the urban decay website! I just ordered mine!